Casa Lakeville is a high-end residential development on the east-end of the French Concession, just steps away from the posh entertainment district of Xintiandi and the bustling commercial area of Huaihai Middle Road. 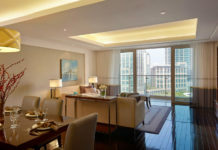 Completed in 2009, this is one of the most modern and luxurious apartments available to Shanghai residents. Despite being located in one of the most vibrant areas of the city, Casa Lakeville offers its residents a lush, green environment that is perfect for relaxation. Residents are a quick 2 minute walk from the gorgeous Taipingqiao Lake, a manmade lake and park in the heart of Xintiandi. Likewise, the compound itself offers a picturesque array of ponds, gardens and other greenery that can be a peaceful oasis in the middle of Shanghai’s busiest areas. Casa Lakeville is located in one of the most convenient districts in the city, especially for high-end professionals with high-end tastes. Corporate Avenue, on Hubin Road at the north-end of Taipingqiao Lake, is only 3 blocks away. This is a collection of Grade A office buildings meant specifically for multinational offices. A 10-minute walk north will bring you to the famous Huaihai Middle Road, which offers a dazzling array of trendy boutiques, world-famous brands and high-end commercial buildings. Xintiandi, one of the trendiest entertainment districts in the city, is on the doorstep of Casa Lakeville. The shops, café’s and restaurants of Xintiandi were re-developed from an old collection of Shikumen houses (literally, ‘stone gate’ houses). Shikumen houses offer an appealing blend of Eastern and Western architectural designs. These were popular in the 1920s and 30s, and are unique to Shanghai. Residents of Casa Lakeville have convenient access to this trendy area, where they can experience world-class luxury within the quaint ambience of these traditional Shanghainese buildings. Residents also have a wide-range of comforts at their disposal within the compound, such as the state-of-the-art clubhouse. Fitness fanatics can work out in the fitness center or indoor swimming pool, while those with a love of fine living can enjoy the quiet atmosphere of the café, art gallery or cigar lounge. Residents with a busy work schedule can work in the fully-equipped business center while their children enjoy the playroom. Fashionistas can also enjoy the Casa Lakeville fashion center, which boasts a number of flagship stores for international brands, a design training institute and a City Shop supermarket, offering residents the best organic ingredients around. The apartments within Casa Lakeville are all designed with a modern, minimalist decoration scheme in mind. The furniture is both tasteful and comfortable, which will impress guests with both its aesthetic qualities as well as its relaxing nature. The apartments were constructed specifically to suit international tastes. As such, the central AC/heating and the double-glazed windows (both rare in Shanghai) offer a welcome respite from the bitter winters and humid summers.